Heat oven to 325°F. Generously spray bottom only of 9x5-inch loaf pan with baking spray with flour. In medium bowl, beat cake mix, cream cheese, water, grated lemon peel and eggs with electric mixer on low speed 1 minute, scraping bowl frequently, then on medium speed 2 minutes, scraping bowl occasionally. Pour into pan. Bake 50 to 60 minutes or until toothpick inserted in center comes out clean. Cool in pan 10 minutes. Remove from pan to cooling rack or heatproof serving plate. Cool completely, about 1 hour. In small microwavable bowl, microwave frosting uncovered on High 10 to 15 seconds or until frosting is thin enough to drizzle; stir. Spoon frosting evenly over cake, allowing frosting to drip down sides. 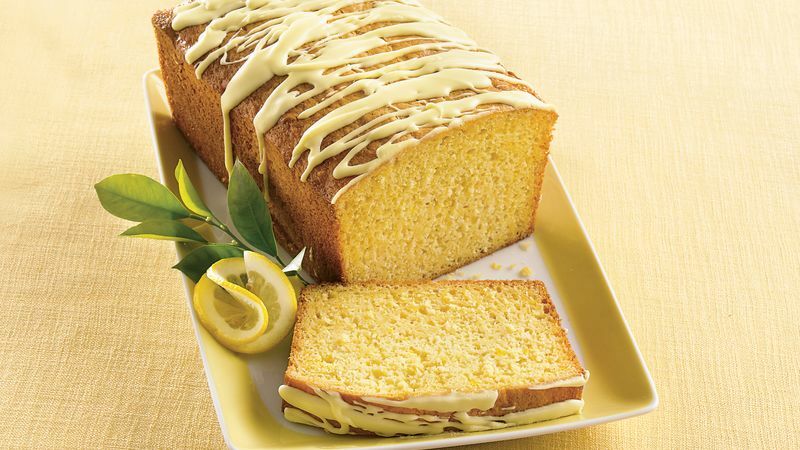 If you have leftover cake, cut it into slices and place individually in sandwich-size food-storage plastic bags. Seal bags and freeze. You'll have a quick treat when you need it!